I said it before and I’ll say it again. I had an allocation for a German GT3 RS incoming in the second batch (expected delivery in July) and was warned about a loss of 20 ps and of course a weight penalty that goes with a particulate filter. Porsche were making these penalities very apparent to me so that I could decide if I wanted to proceed. No information about PF or loss of 20ps in the second EU batch of GT3 RS at my Porsche Centre, the second batch production runt starts week 24 I was told and it sounds that the Speedster production will start at the same week. Everyone I talked to about the second EU batch of 3RS says the same thing - same power, torque, performance. Slighly more muted sound and slight weight penalty (8kg or something, I forget). I’ve also been told I have a June production slot which would agree with your week 24 statement. On the other hand another large dealer told me no way there are any June EU builds due to the WLTP situation, so hard to know what to think. I would think that Porsche builds 991’s as long as possible. I was told all Speedster's would be delivered in the US before 2019 year end. I will know shortly if my incoming GT3 RS will have a particle filter. When I did euro delivery in December, I was told no particulate filters would be placed on the 3rs. Both years. That's what I heard and that the spec/config should be coming this spring. Right in time for the dead of winter for most folks not to be able to drive the car. Would have been better to have revealed the car at Geneva and deliver the cars in Aug/Sept in the US. Got following infos from my dealer in EU. Dealers already got their allocation number (have been ask to choose a personnal serial number for luckiest one). Car orderable from may... delivery before end of 19. Received a call from my SA telling me that the allocations will be dispersed obviously first to 918 owners, then 2RS and 3RS people skipping over people who otherwise have deposits but not owners of the above cars. Color combinations will be Speedster unique and never to be available as PTS in any other car. Definitely VIP 918 owners will get first spot but the rest you mentioned must be related to your dealership not Porsche. We’ve heard the no PTS before. I’d wait if I wanted PTS. Outside of the 918 owners, next in line would be the VVIP (Very VIP) who are multiple buyers of Porches year in and year out as dispositioned by the dealers preferred customer lists. Then whatever is left out is for general consumption, if any. 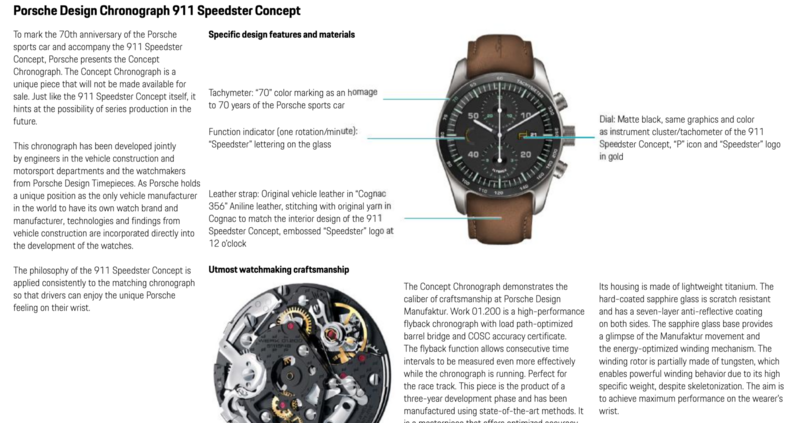 Car will come as an option, with a matching numbered watch similar to Exclusive Series. Agree. The PTS may open for a very short period of time like the 911R. Last edited by GT3RS-Fan1; 03-30-2019 at 12:24 PM. Assuming that it comes with either a manual or PDK and either CF buckets or sport seats what are the preferences? Open top grand touring most probably primary use. One part of me says PDK with sofas given traffic and longer drives. Another part of me says stay with ethos of speedster with manual and lightweight seats.